How safe are hospitals? Why do some hospitals have higher rates of accident and errors involving patients? How can we accurately measure and assess staff attitudes towards safety? How can hospitals and other healthcare environments improve their safety culture and minimize harm to patients? These and other questions have been the focus of research within the area of Patient Safety Culture (PSC) in the last decade. More and more hospitals and healthcare managers are trying to understand the nature of the culture within their organisations and implement strategies for improving patient safety. The main purpose of this book is to provide researchers, healthcare managers and human factors practitioners with details of the latest developments within the theory and application of PSC within healthcare. It brings together contributions from the most prominent researchers and practitioners in the field of PSC and covers the background to work on safety culture (e.g. measuring safety culture in industries such as aviation and the nuclear industry), the dominant theories and concepts within PSC, examples of PSC tools, methods of assessment and their application, and details of the most prominent challenges for the future in the area. 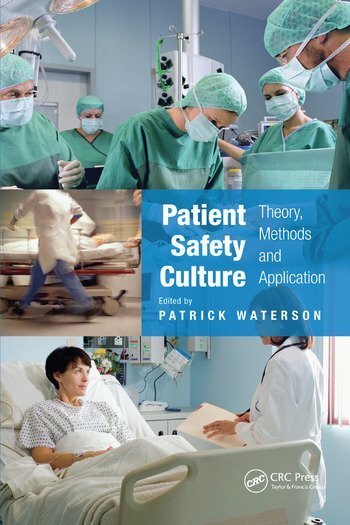 Patient Safety Culture: Theory, Methods and Application is essential reading for all of the professional groups involved in patient safety and healthcare quality improvement, filling an important gap in the current market. Dr Patrick Waterson is Reader in Human Factors and Complex Systems in the Design School at Loughborough University. His research involves applying ideas and concepts from systems thinking and the systems approach to healthcare (e.g. methods for assessing patient safety culture, the implementation of health care information technology and the causes of health care-related accidents and error). Patrick has published widely within the area of human factors accident causation and patient safety.